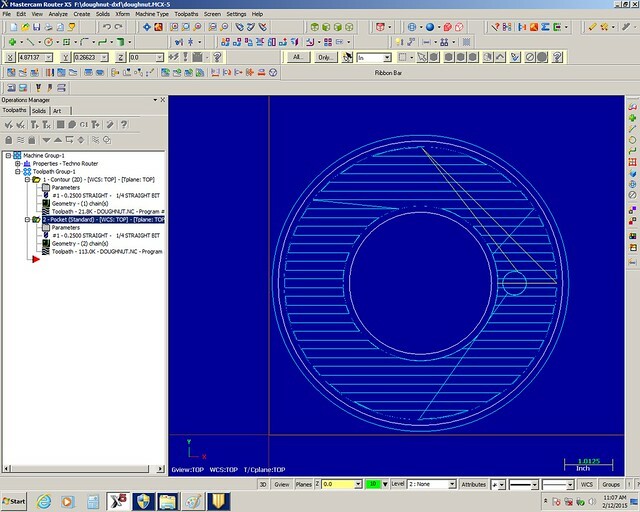 Now that we are getting familiar with 2.5D objects and milling, we will dive deeper into CAD, CAM, and setting up a 2.5D CNC router job. 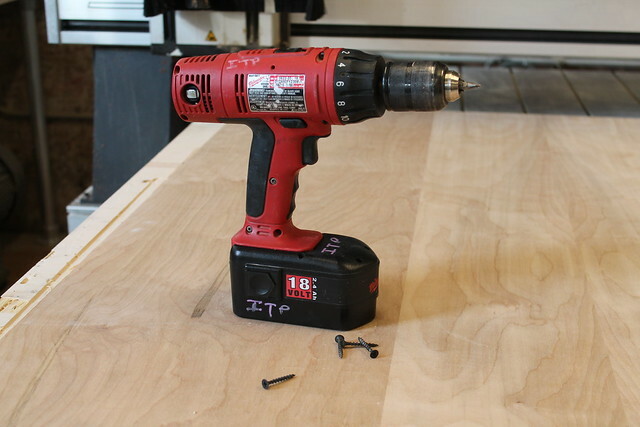 Note: You will need a thumb drive (or similar storage device) to transport files from your computer to the CAM station to the CNC machine. 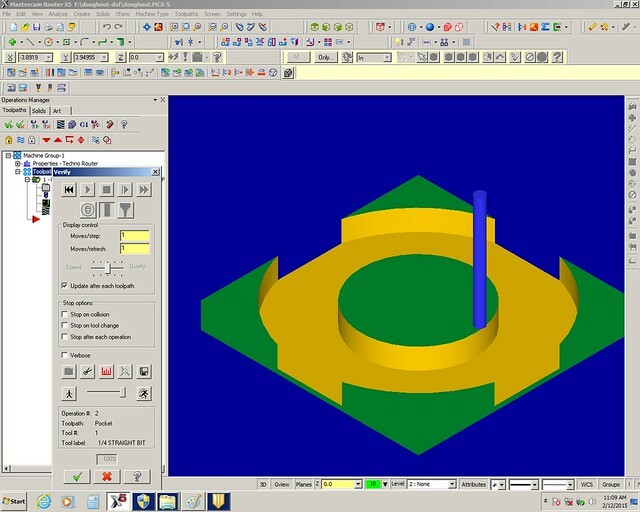 Before you get to the CAD and CAM you must have a material choice and end mill in mind. 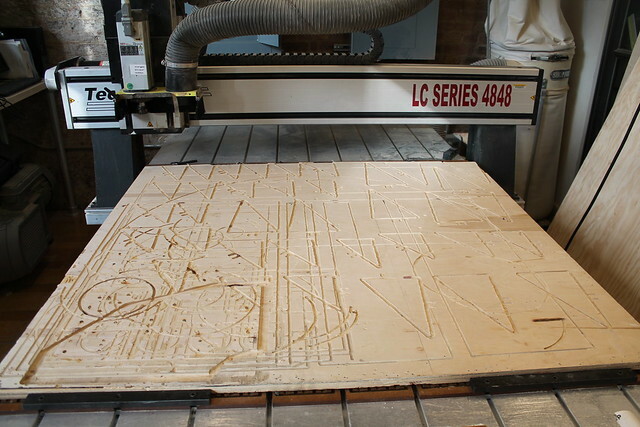 When it comes to the CNC router, knowing material thickness before designing is very important. 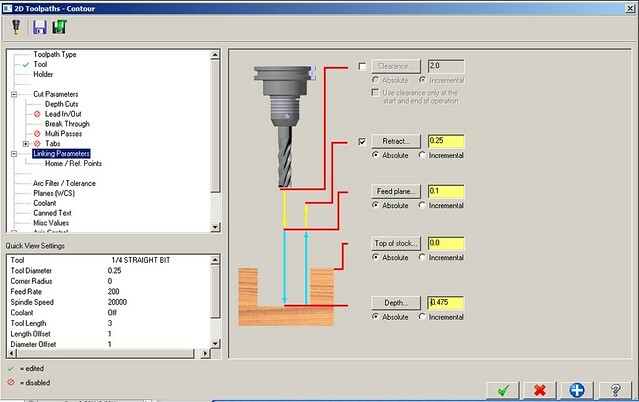 Thickness will determine depth of contours, how long and end mill has to be, as well as joint designs. And remember, even if a material is labeled a certain thickness, that does not mean it is actually that thickness. Fractions of an inch count here. For the time being, our CAD (Computer Aided Design or Drafting or Drawing) of choice will be VectorWorks. If you haven’t already, please download the free student version. Again, we will stick to 2D drawings for now in order to create 2.5D parts. Simple drawings can turn into involved parts. We’ll go over the basics of creating drawings quickly so we can get to the CAM. Demo will highlight combining simple geometry using the paint bucket tool, drawing placement, and exporting the file(s) correctly. 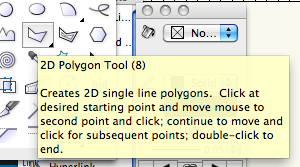 The 2D Polygon Tool can make complicated geometry very quickly from simple shapes. The CAM (Computer Aided Manufacturing) we will be using is MasterCAM. 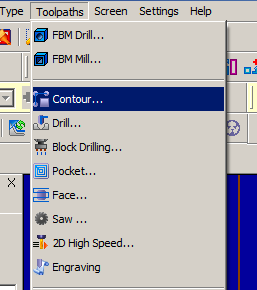 MasterCAM can seem a little daunting for first time users, but we will strip it down to the basics: operation type (contour or pocket), tool selection, pass properties, and depth of cut. Choose the proper machine – Techno Router. You will need to specify, is the cut is to be made on the inside of the line or on the outside of the line. If the arrow is pointing in a clockwise direction, the cut will be made on the outside of the line. If the arrow is pointing in a counter-clockwise direction, the cut will be on the inside of the line. The direction of the arrow can be changed by clicking the button shown below. 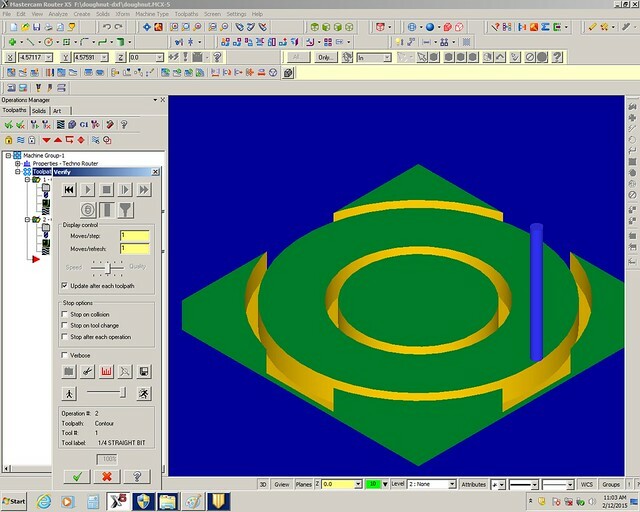 Consider a 6″ diam circle with a 3″ diam circle in the middle. The image below chose to go in a counter clockwise direction for the 3″ diam circle. The end mill would be on the inside of the line and cut out a 3″ diam hole. The image below chose to go in a clockwise direction for the 3″ diam circle. The end mill would be on the outside of the line and cut out a 3″ diam cylindrical plug. The center hole would have a diameter of 3″ plus twice the diameter of the end mill you are using. Consider the same drawing now with a pocket operation. The images below have a pocket done to the center circle. The images below have a pocket operation done between the inner and outer circles. 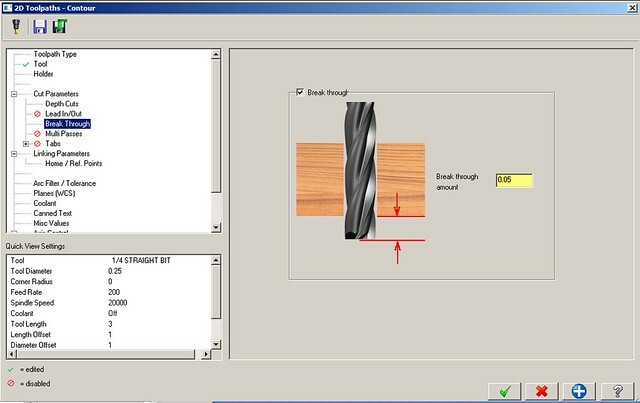 Click “Select library tool” and choose the end mill you intend to use, in this case 1/4″ diam straight bit. This is the max depth of cut of each pass. Remember, no more than the radius of the bit you intend to use. In this case 0.125″ for a 1/4″ end mill. You must know what end mill you will be using at this point. Think of breakthrough as that little bit extra to ensure a cut makes it all of the way through the material. 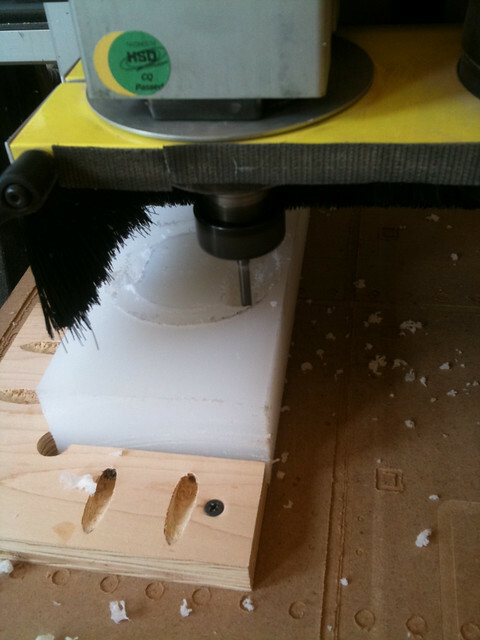 Typically, if you are cutting out a piece, you want breakthrough turned on, otherwise you want it off. You have to set the depth of every operation. A complete cut through will have a depth equal to thickness of your material. You never want to have a depth greater than your material thickness. And the depth is always negative, since the Z axis origin in the top surface of your material. You must know the dimensions of the material you will use at this point. If you have multiple operations, you can see one at a time or all of them if you click on “Toolpath Group”. Click the button highlighted above to animate the operations. Click the play button to see the simulated operations. 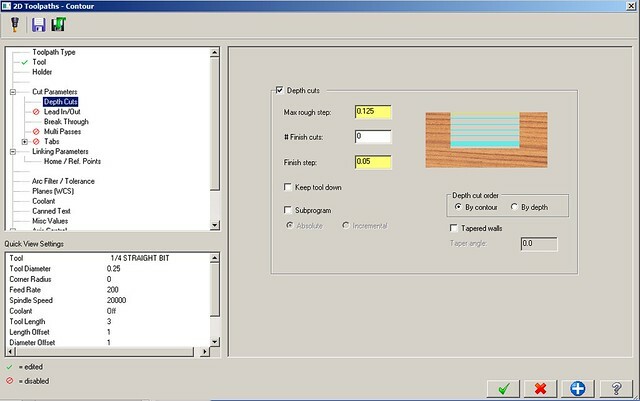 Make sure you have clicked “Toolpath Group” when you create the G-code. 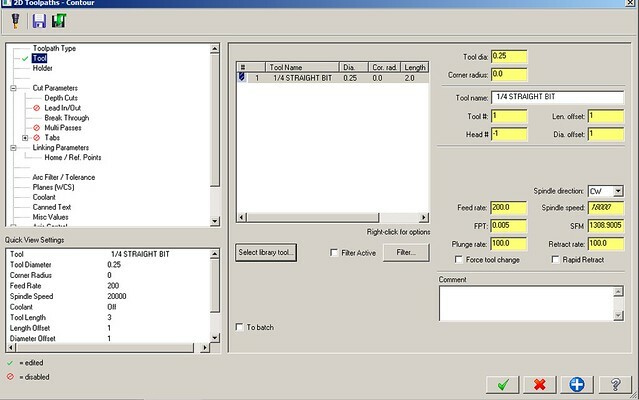 This will create a .nc file (the nc in CNC). 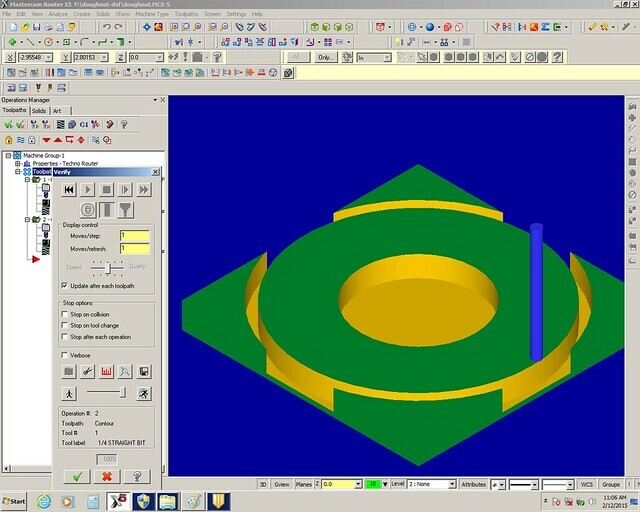 Save both G-code and MasterCAM file to a thumb drive. Click the button highlighted above to create the G-code. The CNC (Computer Numeric Control) Router is basically just a bigger, louder, more powerful version of the OtherMill. We will be using 1/4″ diameter endmills, they will either be an up-cut or a down-cut. Depending on which way the spiral goes on a cutter, you get a cutter that either moves the chips up or down. Whichever way the chips are going, there is also force exerted on the workpiece in the same directions. 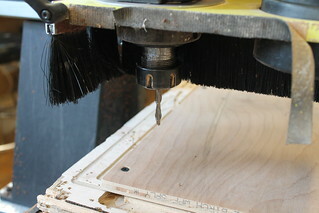 So, an upcut will move the chips up and out of the cut, and it will tend to pull up on the workpiece. An upcut is a conventional endmill for all intents and purposes. For wood and materials that may chip, it has the disadvantage that it wants to pull chips along the top edge. Since a downcut pushes down, it leaves a cleaner cut on top, but can fray the bottom edge. The upcut wants to pull up on the workpiece. The downcut forces the chips down to the bottom of the hole. 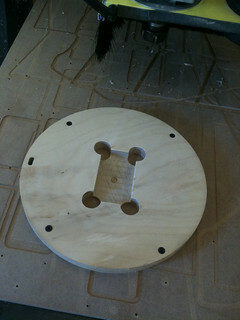 The spoil board is the sacrificial material between your material and the CNC bed. Digging into the material a little bit is good, digging into it a lot if bad. 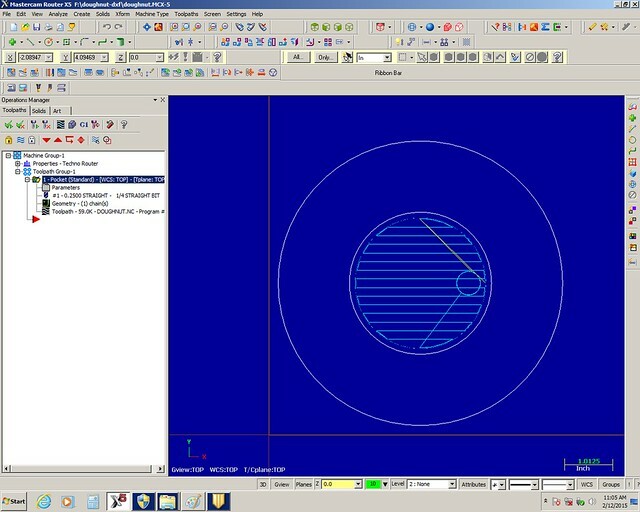 Large sheet material is typically screwed down to the spoil board which should be relatively pristine and secured to the CNC. 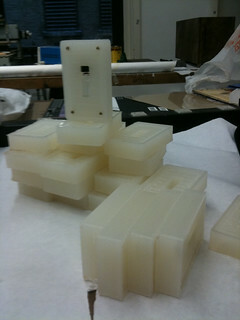 Tall chunks of material may need more bracing or custom jigs. The spindle can be jogged into position, typically the front left corner, just above the surface of the material to be cut, is an ideal origin point. Once in position, click “Zero” on the Techno Interface, and click “All”. This will set origin. 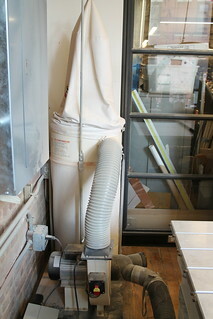 Before you begin any operation on the CNC, you must turn on the vacuum. You begin the job by clicking the “Start” button on the interface. 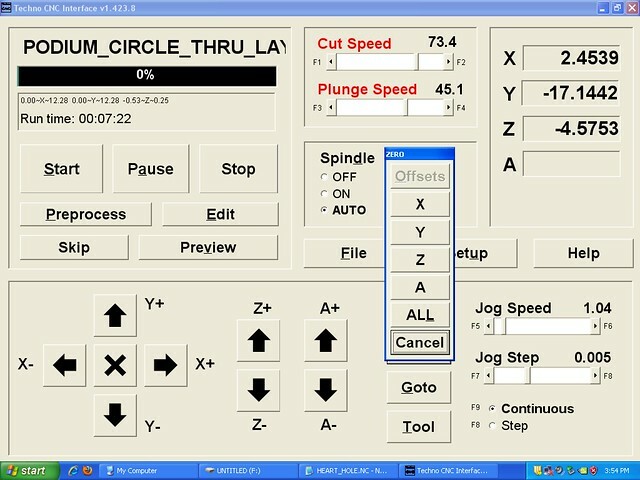 The button will then read “Resume”, click again, the spindle will come up to speed, and the job will start. 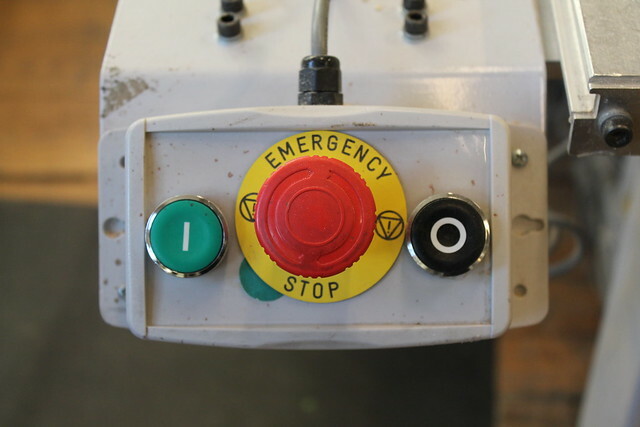 Be aware of where the pause (black button on the right), start (green button on the left), and emergency stop (red button in the middle) buttons are. You NEVER leave a job unattended. A job can be paused and restarted, but if you hit the emergency stop the job is lost. 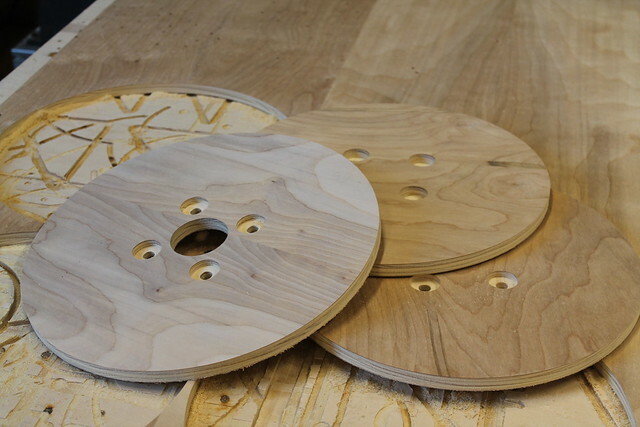 Typically, flat, standard thickness, man-made material is cut with the CNC (plwodd or MDF). But you can cut natural wood, plastic, soft metals, and foam. As long as you are using the proper end mills and the material is securely mounted to the CNC bed, these materials can be cut. When done with your job, remove and return the end mill and collet. 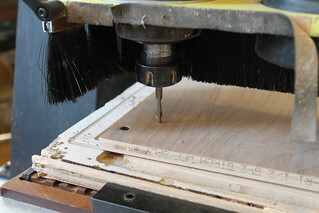 Remove secured material from the CNC bed. 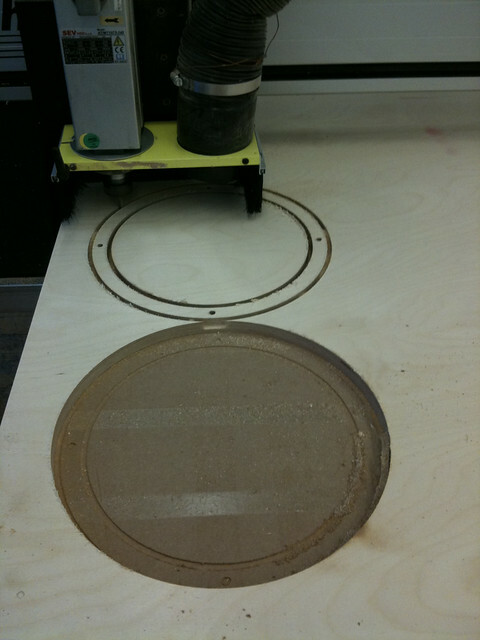 Shut down the CNC, vacuum, and the PC. 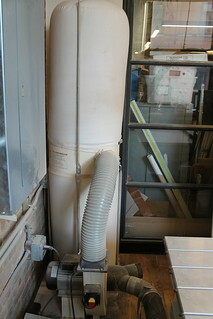 Vacuum up all of the dust created. 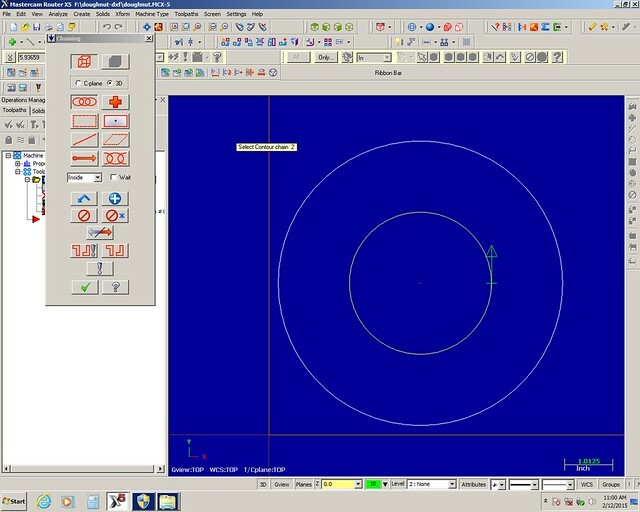 VectorWorks, MasterCAM, and CNC routing. 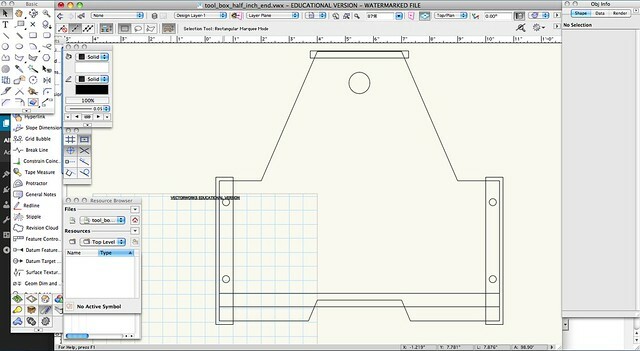 In this skill builder you will become familiar with creating simple 2D drawings in VectorWorks (CAD), creating basic cutting operations in MasterCAM (contour cuts and pockets), and running a job on the CNC router. Buy 1/4″ Straight End Mill, Down-cut and/or 1/4″ Straight End Mill Up-cut (for milling wood, plywood, MDF) if you don’t have one already.